Our plan this day was to drive the legendary Dingle Peninsula. 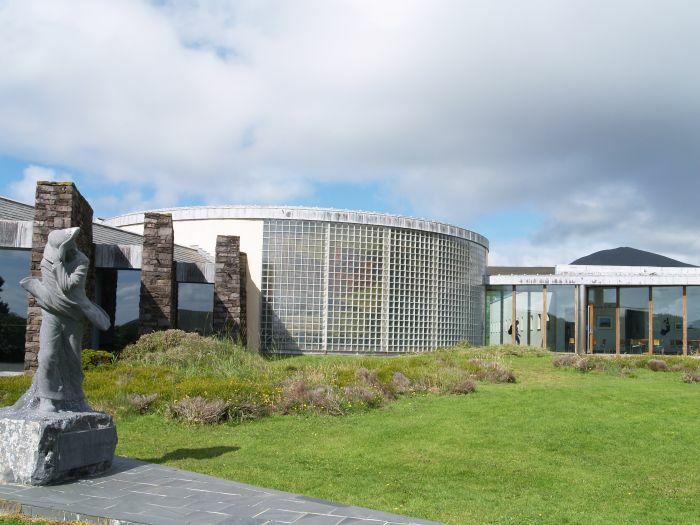 The peninsula is the westernmost tip of Ireland and offers just the right mix of far-and-away beauty and ancient archaeological wonders all within convenient reach from the town of Dingle. Rain rain go away! This is a view of Ventry Bay with Skellig Michael island in the distance. We pulled off to the "side" of the road many times to stop and take pictures of the Emerald Isle. Dingle feels so traditionally Irish because it's part of the Gaeltacht, a region where the government subsidizes the survival of the Irish language and culture. While English is always there, the signs, chitchat, and songs come in Gaelic. The loop trip around the peninsula is about 30 miles long and must be driven in a clockwise direction. A little way down the road we passed by the pub owned by Irish football star Páidi Ó Sé - a household name in Ireland. He won eight all-Ireland football titles for Kerry as a player and after coaching the team for years he now runs this pub. Urban Irish families come out to villages here to immerse their kids in the traditional Irish culture and wild nature. After about 13kms we got to our first stop: a group of beehive huts. Despite the wind and rain, we bundled up and trudged up the hill to check them out. These mysterious stone igloos, which cluster together within a circular wall, are a fascinating sight. According to the guide given out at the ticket booth, structures like these would have been inhabited from ancient times and the Early Christian Period, up until around 1200 AD. Inside one of the huts. This one didn't have a roof, other ones did. Our family at the beehive huts on the Dingle Peninsula on Sunday September 20th 2015. Super cool. The huts were often attached to each other with a doorway leading from one structure to the next. No mortar was used, instead they were erected in the form of circles of successive strata of stone, each one lying a little closer to the center than the one beneath until only a small aperture is left at the top which was closed by a capstone. This method of building is known as corbelling. A hut with an intact stone roof. After enjoying the cool ruins, we hopped back in the car and pushed on through the rain. We forded a stream, which with the rain was a pretty good flow. There has never been a bridge here; this bit of road, nicknamed the "upside-down bridge," was designed as a ford. Our mighty Nissan Qashqai rental plowed through like a Land Rover. "Stop looking at me swan gull!" The gorgeous views as we neared Slea Head. 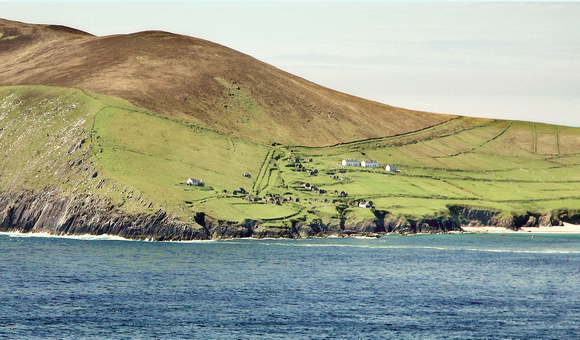 On clear days you could see out to the Blasket Islands. Even though the fog and clouds limited our visibility, I think it made the whole landscape even more Irish. Isn't this how you picture the Emerald Isle? The scattered village of Dunguin, or Dún Chaoin in Gaelic, has many ruined rock homes abandoned during the famine. Some are fixed up and you can see good examples of land reclamation, patch by patch, climbing up the hillside. Rocks were cleared and piled into fences, sand and seaweed were laid on the clay, and in time it was good for grass. The created land, if at all tillable, was generally used for growing potatoes, otherwise it was only good for grazing. Lovely stream running down the hill. Just off the road is a small stone marker commemorating the 1588 shipwreck of the Santa Maria de la Rosa of the Spanish Armada. It was a fascinating glimpse at the lives of those who called the Great Blasket (an island off the coast of Ireland) home. This isn't my photo of the island below, we couldn't even see it because of the fog, but the whole thing of people living such a way by choice, on a tiny island, shut off from the world... I think it's a little creepy! Eventually the government made the people come live on the mainland and now it's a deserted island that people can tour. After getting lunch at the museum cafeteria we enjoyed the rest of the drive and were glad we were dry in the car on this wet, windy day. After completing the loop we stopped in the town of Dingle to get a magnet and umbrella. Then we drove to our airbnb in Limerick which was also super nasty and we didn't want to be in there at all so we jumped right back in the car and headed into the center of Limerick. Proof that I drove on the wrong side of the street! Sure it was only for 50 feet, but hey, it counts! 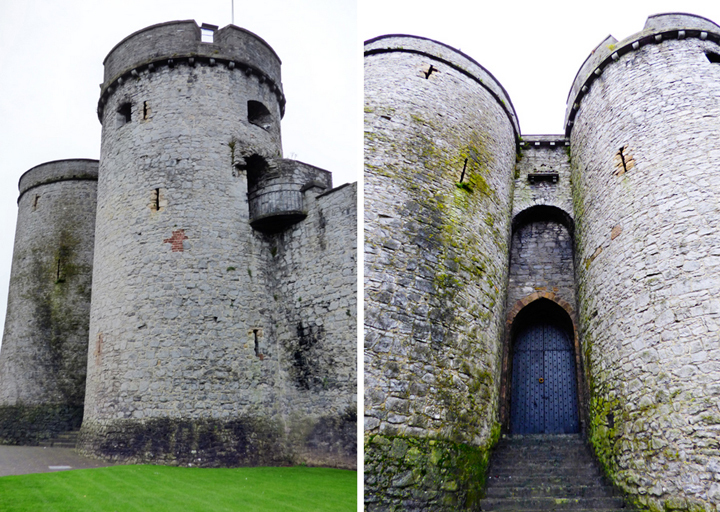 Chris looked up on Google that King John's Castle in the heart of Limerick was open so we found parking across the river. Despite what Google said, the castle was actually already closed, wah wah. 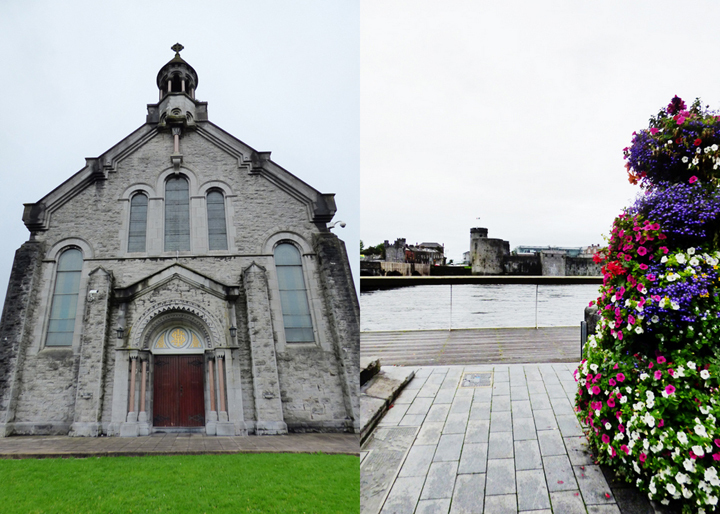 So we walked around Limerick a little more, got some groceries, and then headed back to the airbnb. Next up: the amazing Cliffs of Moher! Even though it rained ... those are some pretty AWESOME looking photos!! Loving the fog shots!! 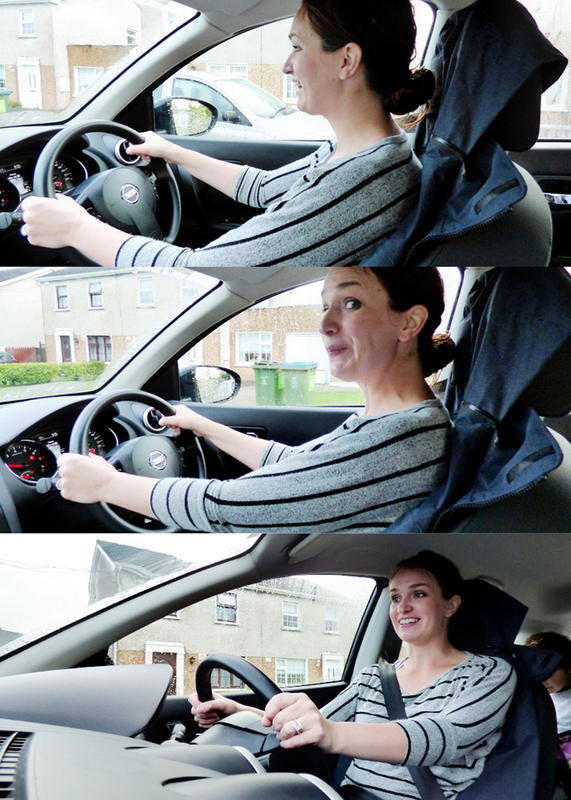 And you look adorable driving!!! I bet that was hard doing it on a different side!!! Crappy weather, but definitely not crappy views! Thanks so much for the tour! Wow, you truly had an Irish experience--rain, pub and castle and all.